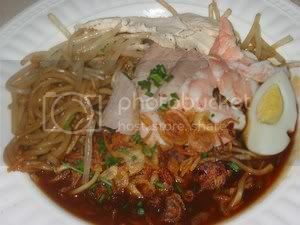 Mee bandung is also a dish originated from Johor, specifically from Muar. The term 'bandung' is not derived from Bandung, Indonesia but as a term for anyting that is mixed from many ingredients. I used to go to Muar for work but i did not know that mee bandung originated from there until i read the history of Johor. Well, if i have the opportunity to visit Muar again, i will certainly know what i want for lunch. 1. Bring a pot of water to a boil. Add in sliced shallots, garlic, local celery, tomatoes and crushed ginger. Reduce to low heat and simmer for 3-5 minutes. 2. Add in beef broth , prawn cube, tomato ketchup and chilli boh. Stir well and adjust seasoning with sugar to taste. 3. Simmer for 5 minutes and strain. 4. Put the pot holding the gravy back on the stove and gradually add in beaten egg white. Remove and keep warm. 1. Blanch yellow noodles in a pot of boiling water for a few seconds. 2. 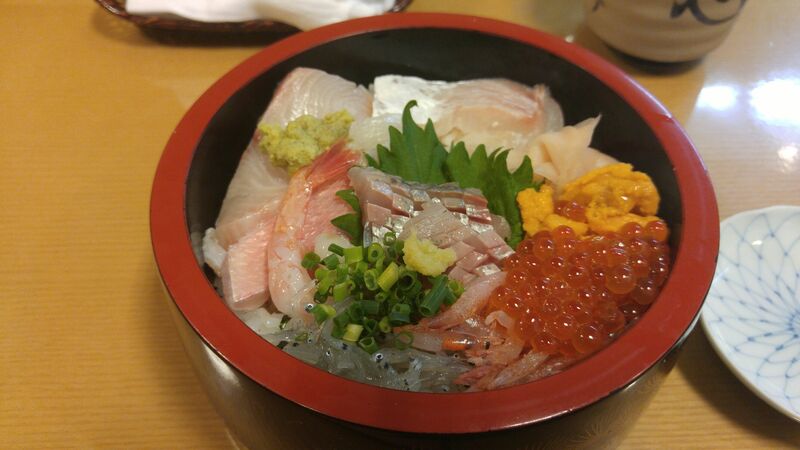 Remove, strain and place it into serving bowls. 3. Add in sliced fish cake and blanched beansprouts. 4. Pour in hot Bandung gravy and garnish with shredded chicken, sliced spring onions, local celery, chillies, fried shallots and calamansi. 5. Sprinkle with grounded peanuts and serve hot. This Italian-American classic features braised chicken pieces in a tomato broth. It's great on its own or over pasta. 1.Pat the chicken dry with paper towels and season it well with salt and pepper. 2. Dust the chicken all over with flour and shake off as much excess as you can. 3. Heat the oil in a large pot over medium heat. 4. When the oil is nice and hot, add the chicken and brown it on all sides. Be careful not to let it get too dark. 5. Remove the chicken and add the onion. 6. Saute the onion until tender, stirring frequently. 7. Cut the tomatoes into large pieces and add them to the onion. Reserve all the juices. 8. Add the wine and let mixture come to a boil. 9. When the wine has almost boiled away, return the chicken to the pan. 10. Add the bay leaf and 1/2 c. parsley, the reserved tomato juice and the broth. 11. Lower the heat to a very slow simmer and cook for 45 minutes. 12. During cooking, skim off all the foam and oil that rises to the surface. 13. Place the chicken on a serving platter, remove the bay leaf, and spoon the sauce over the top. 14. Sprinkle on the remaining parsley and serve. 15. 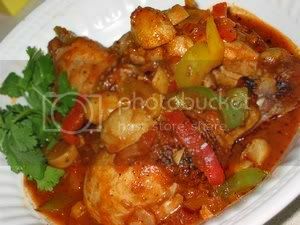 If you prefer a thicker sauce, place the chicken on a platter and simmer the sauce rapidly until it thickens. An optional step is to puree the onions and tomatoes into the simmered sauce with a hand blender or food processor. Try to use chicken pieces that still have their bones. Bone-in pieces are easier to cook this way. You can boost the flavor of this recipe by sautéing a clove of minced garlic along with the onions, or adding a few whole sprigs of oregano, thyme or rosemary to the dish during the long simmering step. You can add extra vegetables to the onions, including pitted olives, bell peppers and carrots. I had a asian potluck to attend and it was 50 miles up north, taking about 1 1/2 hours depending on the traffic. So, i could not make anything that might spilled over and caused a heart attack for my son in law. Nasi Goreng travelled well and i could cooked it way ahead, leave in the freezer and then reheat before serving. Heat oil and fry the shallots until it is soft. Add in the green curry paste and the pounded ikan bilis, saute until fragrant. Mix in the rice and fry until the rice is coated with the curry paste. Add in eggs and fish sauce. Fry until the eggs are cooked and the rice is so dry that it pops. Garnish with spring onion or fried shallots. What a good way to use up the kimchi that the family is done eating it as a side. Being chinese, frying rice without egg or eggs is not acceptable, so very often this dish had at least 2 eggs added. It is better to use a leftover rice, if there is any, otherwise freshly cooked rice have to be cooled before frying. Take out the insides of kimchi and cut them into small pieces. Chop onions and green onions into small bits and mince the garlic. Season the minced pork with soy sauce, minced garlic and pepper powder. Saute the seasoned minced pork with cooking oil in frying pan. When the pork is cooked, put the onion and kimchi and cook more. After five minutes, put in the minced garlic and green onion. Cook a little more and turn off the heat. Mix well after. After mixing kimchi and pork with rice, turn on the heat again and taste with salt and pepper. Finally put a little bit of sesame oil. 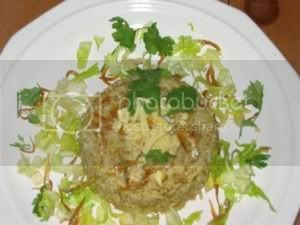 Put the rice into the dish and serve with crushed toasted seaweed and finely shredded omelette. This recipe is from Cafe Evangeline in Denver. Someone requested the recipe and it was published in our local paper. 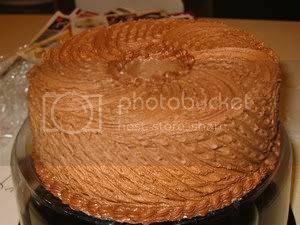 I thought it must be good and tried making it on Thanksgiving 2001. 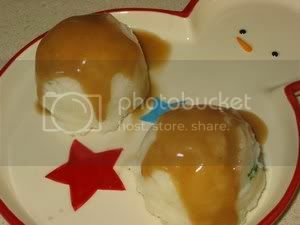 It was really delicious and it has been the dessert for all the Thanksgiving thereafter. Combine all ingredients except pecan pieces in a mixing bowl, beat on low 1 minute. Pour over top of the filling. Bake at 325 degrees f for 1 3/4 hours or until knife inserted in center comes out clean. 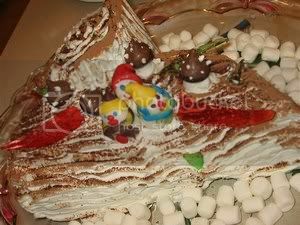 There are many variations in flavor and presentation for the traditional French Christmas log. 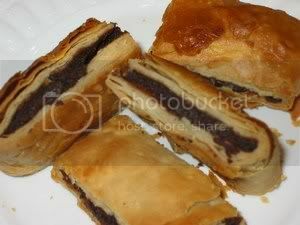 I like this one because the chocolate cake and Nutella filling go together very well. I used Dream Whip to ice the cake and left it white to signify snow. On a slightly damp kitchen towel, dust with confectioner's sugar. Overturn pan on to kitchen towel and remove pan and greased proof paper. Trim edges and roll tightly using the towel to aid the rolling. When cake is cooled, unrolled and spread with Nutella. Rolled it back tightly and leave in the fridge to set. Beat all the ingredients together until stiff. This cake is really delicious, i get to taste it this time. It was requested as a dessert for our Christmas Eve Dinner and i was glad that i had a can of ducle de leche in the fridge. 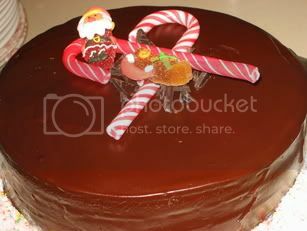 The cake was easy to make and assembling it was fast especially you do not have to make the ducle de leche. The 3 layers of cake were much thinner. I used Dessicated coconut instead of flaked and it was so much easier to work with. Using 2 pieces of greased paper, i rolled the filling inbetween into a disk to fit the cake. Trimming the edges or rim of cake evenly, i was able to use as little of the ganache as possible and leave enough to pour over cake. Heat the remaining frosting until pouring consistency. I have always known 'farn shee' as sweet potato and it comes in all color, size and shape but here in the States, it is called yam for the very yellow type and the paler yellow is sweet potato. It was the alternative diet to rice, known to the older generation who went through the Japanese Occupation in Malaysia and they have no desire to eat it anymore. To me, sweet potato in sweetened ginger soup is a comfort food. 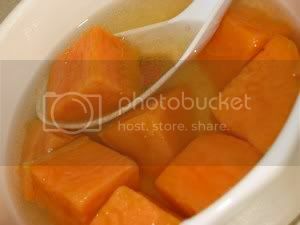 Peel sweet potato/yam and diced into cubes(leave in water as it will turn brown due to oxidation). Remove the skin from ginger and slice thin. Put diced sweet potato/yam, ginger and water and bring to boil. Turn heat down to simmer until sweet potato/yam is fork tender. Add in sugar and cook until sugar dissolves. 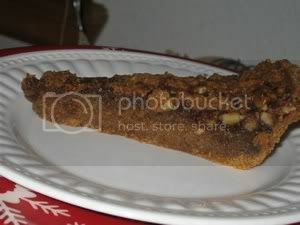 Ginger slices can be removed before serving. "Queso" is cheese in Spanish. And a quesadilla is a toasted tortilla with melted cheese inside. But in addition to cheese, you can put practically anything in a quesadilla. I was trying to finish my roasted turkey and made this for breakfast. TOP each tortilla with 1/4 cup of refried beans, 1/4 cup cheese and shredded turkey ; fold tortillas in half. HEAT large nonstick skillet on medium heat. Add about 1-1/2 tsp. of the butter; heat until melted. 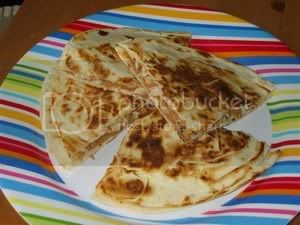 Add 1 folded tortilla; cook 3 minutes on each side or until golden brown on both sides. Remove from skillet; cut into 6 wedges. Cover to keep warm. Repeat with remaining tortillas, adding remaining butter to skillet as needed. This dish is served as a side for our Christmas Dinner and without fail, it was there again this year. In 1 1/2 quart casserole, combine soup, milk, soy sauce and pepper. Stir in green beans and 1/2 can of the onions. Stir and top with remaining onions. With all the rich food served for the Christmas Dinner, a skinny side dish is called for and a mashed potatoes is a must have. PLACE broth and potatoes in saucepan. Heat to a boil. Cover and cook over medium heat 10 min. or until tender. MASH potatoes with 1 1/4 cups broth and pepper. This was made for the Christmas Turkey and Ham Dinner and it is so rewarding compared to store bought. 3 1/2 cups(17.5 ounces) unbleached high-protein all purpose flour(such as King Arthur) or 4 cups (20 ounces) unbleached all-purpose flour(such as Pillsbury or Gold Medal). Microwave milk, butter and sugar until butter is mostly melted and mixture is warm(about 110 instant read thermometer), about 1 1/2 minutes. Whisk to dissolve and blend in sugar. Beat eggs lightly, add about one-third of warm milk mixture, whisking to combine. When bottom of bowl feels warm, add remaining milk mixture, whisking to combine. Combine flour and yeast in bowl of standing mixer with paddle attachment, mix on lowest speed to blend, about 15 seconds. With mixer running, add milk and egg mixture in steady stream, mix on low speed until loose, shiny dough forms(you may also see satiny webs as dough moves in bowl), about 1 minute. Increase speed to medium and beat 1 minute, add salt slowly and continue beating until stronger webs form, about 3 minutes longer. Dough will remain loose rather than forming a neat, cohesive mass. Transfer dough to large bowl, cover bowl with plastic wrap, and place in warm, draft free spot until dough doubles in bulk and surface feels tacky, about 3 hours. Line rimmed baking with plastic wrap. Sprinkle dough with flour(no more than 2 tbsp) to prevent sticking , and punch down. Turn dough onto floured work surface and form into rough rectangle shape. Transfer dough rectangle to lined baking sheet, cover with plastic wrap and refrigerate overnight. Turn dough rectangle onto lightly floured work surface and, roll dough to a 20 x 13 inch rectangle, use a pizza wheel to trim edges, Cut dough at half lengthwise, then cut 16 triangles. To shape, elongate each triangle before rolling crescent, stretching it an additional 2 - 3 inches in length. Starting at wide end, gently roll up dough, ending with pointed tip on bottom. Arrange crescents in four rows on parchment-lined rimmed baking sheet, wrap baking sheet with plastic wrap and refrigerate at least 2 hours or up to 3 days. Remove baking sheet with chilled rolls from refrigerator, unwrap and cover with overturned large dispossable roasting pan(alternatively, place sheet pan inside large garbage bag). 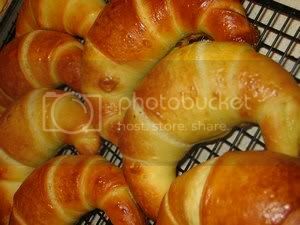 Let rise until crescents feel slightly tacky and soft and have lost their chill, 45 - 60 minutes. Meanwhile, turn oven light off, place rimmed baking sheet on lowest rack, adjust second rack to lower-middle position and heat oven to 425 f.
With pastry brush, lightly dab risen crescent rolls with egg wash.
Transfeer baking sheet with rolls to lower-middle rack and working quickly, pour 1 cup of hop tap water into hot baking sheet on lowest rack. Close door immediately and bake 10 minutes, reduce oven temperature to 350 f and continue baking until tops and bottoms of rolls are deep folden brown, 12 - 16 minutes longer. Transfer to wire rack, cool for 5 minutes and serve warm. You can make the dough up to 4 days ahead of time or even partially bake the rolls and freeze them for longer storage. To do this, begin baking the rolls but bake at 350 f for only 4 minutes or until the tops and bottoms brown slightly. Place the partially baked rolls in single layer inside a zipper lock bag and freeze. When ready to serve them, defrost at room temperature and place them in a preheated 350 f oven for 12 - 16 minutes. you can freeze the rolls for up to 1 month. We were at Sea World San Diego on Thanksgiving but the 22lb turkey was defrosting in the fridge and it was defrosted, ready for brining for our early Christmas. 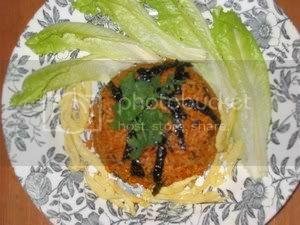 I have made this recipe from Cooks Illustratred since it was published on their november and december 2001 magazine. The wonderful part is that this recipe takes half the time needed and tasted twice better. The recipe calls for a 12 - 14 lb turkey, but mine was 22 lbs, so the baking time has to be a bit longer. 1 turkety(12 - 14 lbs gross weight), rinced thoroughly, giblets, neck and tailpiece removed and reserved for gravy(recipe follows) and turkey butterflied. Dissolve salt and sugar in 2 gallons cold water in large stockpot or clean bucket. Add turkey and refrigerate or set in very cool spot(not more than 40 degrees)(i left mine in the garage as it was freezing during that week) for 8 hours. While turkey brines, adjust one oven rack to upper-middle position and second rack to lover-middle position and heat oven to 250 f. Spread bread in even layers on 2 rimmed baking sheets and dry in oven 40 - 50 minutes for challah or italian bread or 50 - 60 minutes for cornbread. Place bread in large bowl. Whisk together stock, half and half and eggs in bowl, pour over bread and toss gently to coat so bread does not break into smaller pieces. Set aside. Heat heavy-bottomed, 12 inch skillet over medium high heat until hot, about 1 1/2 minutes. Add sausage and cook, stirring occasionally, until sausage loses its raw color, 5 - 7 minutes. With slotted spoon, transfer sausage to medium bowl. 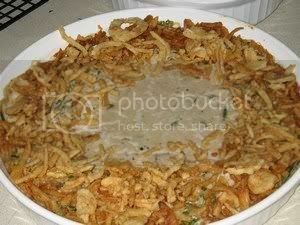 Add about half of onions and celery to fat in skillet, saute, stirring occasionally, until softened, about 5 minutes. Transfer onion mixture to bowl with sausage. Return skillet to heat and add 2 tbsp butter, when foam subsides, add remaining celery and onions and saute, stirring occasionally, until softened. Add in thyme, sage, and garlic, cook until fragrant, about 30 seconds, add salt and pepper. Add this mixture along with sausage and onion mixture to bread and stir gently to combine, trying not to break bread into smaller pieces. Spray disposable aluminum 12 by 16 inch roasting pan with nonstick cooking spray. Transfere dressing to roasting pan and spread in even layer. Cover pan with foil and refrigerate until needed. Set slotted broiler pan top on top of roasting pan with foil-covered dressing and spray with non-stick cooking spray, set roasting pan on baking sheet to support bottom. Remove turkey from brine and rinse well under cool running water. Butterfly the turkey, tie the legs together and position on broiler pan top, thoroughly pat surface or turkey dry with paper towels. 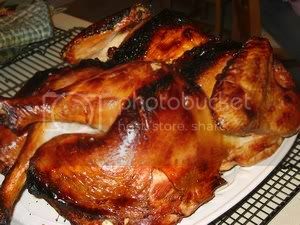 Refrigerate turkey and dressing, uncovered, 8 - 24 hours. Adjust oven rack to lower-middle position and heat oven to 450 f.
Remove broiler pan top with turkey and foil cover over roasting pan, replace broiler pan top with turkey. 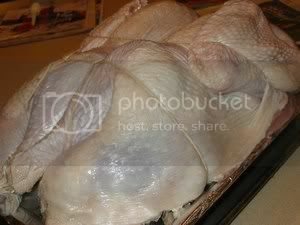 Place entire assembly with turkey in oven and roast until turkey skin is crisp and deep brown and instant-read-thermometer reads 165 f when inserted in thickest part of breast and 175 f in the thickest part of thigh, 80 to 100 minutes, rotating pan from front to back after 40 mintues. Transfer broiler pan top with turkey to cutting board, tent loosely with foil, and let rest 20 munutes. Meanwhile, adjust oven rack to upper-middle position, place roasting pan with dressing back in oven, and bake until golden brown, about 10 minutes. Cool dressing 5 minutes, then spoon into bowl or onto turkey serving platter. To roast the trimmings and vegetables, it's best to use a roasting pan that can sit on the stove top. If you do not own one, a broiler pan bottom will work, when setting it on the stovetop, however, use medium heat instead of high heat and add only half the amount of chicken broth before scraping up the drippings, add the other half of the chicken broth to the saucepan along with the wine. Place turkey trimmings, carrot, celery, onions, and garlic in large flameproof roasting pan. Spray lightly with cooking spray and toss to combine. Roast, stirring every 10 minutes, until well-browned, 40 to 50 minutes. Remove roasting pan from oven, and place over burner(s) set at high heat, add chicken stock and bring to boil, scraping up browned bits on bottom of pan with wooden spoon. Transfer contents of roasting pan to large saucepan. Add wine, 3 cups water and thyme, bring to boil over high heat. Reduce heat to low and simmer until reduced by half, about 1 1/2 hours. Strain stock into large measuring cup or container. Cool to room temperature, cover with plastic wrap and refrigerate until fat congeals, at least 1 hour. To finish gravy, skim fat from stock using soup spoon, reserve fat. Pour stock through fine-mesh strainer to remove remaining bits of fat, discard bit in strainer. Bring stock to simmer in medium saucepan over medium high heat. In second medium saucepan, heat 4 tbsp reserved turkey fat over medium high heat until bubbling, whisk in flour and cook, whisking constantly, until combined and honey-colored, about 2 minutes. Continuing to whisk constantly, gradually add hot stock, bring to boil, then reduce heat to medium low and simmer, stirring occasionally, until slightly thickened, about 5 minutes. Season to taste with salt and pepper and serve with turkey. (Can be refrigerated up to 3 days, reheat in medium saucepan over medium heat until hot, about 8 minutes). There are so many shanghai pancake recipes that i have tried making. Some turned out greasy and hard. I found this one from Kuali and it has been a keeper. Leaving fried pancake in a slow oven for a while will help to further cook the inside layers of pastry and remove some of the grease. Use any ready-made red bean paste or lotus seed paste. Combine ingredients for pastry a well toform a soft dough. Mix ingredients for pastry b to form an oil dough. Divide dough (A) into two equal portions. Divide dough (B) into two equal portions. Place dough (B) in the centre. Fold dough (A) to cover up the oil dough (B). Fold the sides to the centre again and roll out flat again into a rectangle. Cover up the paste with the sides of the pastry. Deep-fry the pancake in oil till golden brown and leave in a preheated 300 f oven to finish the browning. Cut into slices and serve when cold. This cake is always popular with chocolate lovers and i made it for Sandra's office potluck. I found this recipe in The Taste of Home magazine and what interested me was that this recipe submitted by Saburo Aburano of Ann Arbor, Michigan, was given to her by a dear friend more than 30 years ago. Since i am of age - 60 years, i have an infinitely for old recipes. Beat 1 egg white on medium speed until soft peaks form. Gradually beat in sugar, 1 tbsp at a time, on high until stiff glossy peaks form and sugar is dessolved. Fold in coconut and flour, set aside. Beat the 4 egg whites on medium until soft peaks form. Gradually beat in 1/2 cup sugar, 1 tbsp at a time, on high until stiff glossy peaks form and sugar is dissolved, set aside. Cream shortening and remaining sugar. Add the egg yolks, sour cream and vanilla, beat until creamy. Combine the flour, cocoa, baking soda and salt, add to creamed mixture alternately with coffee mixture. Beat until combined. Pour half of the batter into an ungreased 10 in tube pan with removable bottom. Drop coconut filling by spoonfuls over batter. Top with remaining batter. Bake at 350 f for 55 - 60 minutes or until a toothpick inserted near the center comes out clean. Immediately invert cake onto a wire reck, cool completely about 1 hour. Run a knife around side of pan and remove. Combine frosting ingredients. Beat until smooth and creamy. Spread overe the top and sides of cake. It is not a Christmas Dinner if Ham is not served. We had an early Christmas this year and it was a white Christmas. Mix sugar, syrup and mustard until well blended; set aside. Score ham with sharp knife; insert cloves into ham as desired. Place ham on rack in shallow baking pan. 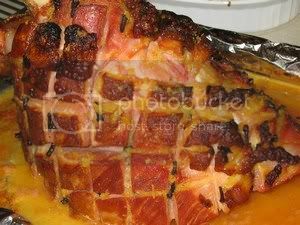 BAKE 2 hours or until ham reaches internal temperature of 140°F when tested in center with meat thermometer, brushing occasionally with 1/2 cup of the syrup mixture after 1-1/2 hours. MIX remaining syrup mixture with cornstarch and pineapple with its liquid in saucepan; cook on medium-high heat until mixture comes to boil and thickens, stirring constantly. Serve with the sliced ham. This recipe is Alton Brown's of Foodnetwork. 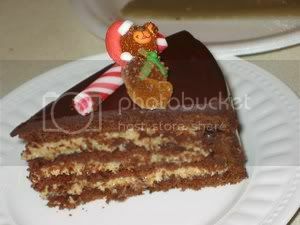 Cake was made 2 days before christmas and hope will be matured enough for the Chinese New Year on Jan 29th. Recipe is supposed to be easy, but with me in high altitude, the cake rised and sunk in the middle. Guessed i should have to use less raising agent , increase the flour and decrease the oven temperature to 300 f. I could not wait for it to mature, therefore have cut a few pieces for tasting. 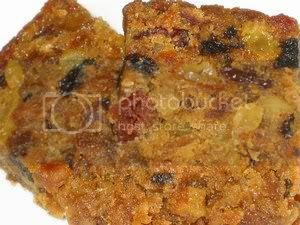 It is nice and moist and my neice, Jo Ann from sydney australia who was here for a visit, commented that, usually she does not like fruitcake but this one suited her palate. Combine dried fruits, candied ginger and both zests. Add rum and macerate overnight, or microwave for 5 minutes to re-hydrate fruit. Place fruit and liquid in a non-reactive pot with the sugar, butter, apple juice and spices. Bring mixture to a boil stirring often, then reduce heat and simmer for 5 to 10 minutes. Combine dry ingredients and sift into fruit mixture. Quickly bring batter together with a large wooden spoon, then stir in eggs one at a time until completely integrated, then fold in nuts. Spoon into a 10-inch non-stick loaf pan and bake for 1 hour. 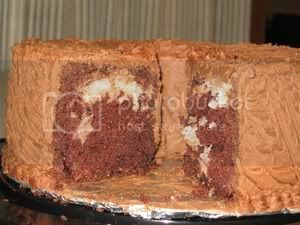 Check for doneness by inserting toothpick into the middle of the cake. If it comes out clean, it's done. If not, bake another 10 minutes, and check again. When cake is completely cooled, seal in a tight sealing, food safe container. Every 2 to 3 days, feel the cake and if dry, spritz with brandy. The cake's flavor will enhance considerably over the next two weeks.